In the aftermath of a deadly viral outbreak, a family reluctantly invites another family into their home. A question often asked by opponents of accepting refugees is "Would you take one into your own home?" It's a dumb question on the surface, as it presupposes the idea that refugees are accepted like Spanish students on an exchange programme, but it strikes deep, as very few of us, no matter how well meaning, would be too quick to accept a stranger into our home. Ever since neanderthal man found shelter in caves, the home has become a sacred place, a refuge from the horrors of the outside world where we keep our families safe. As Trey Edward Shults' sophomore feature, It Comes at Night, demonstrates, a home can be a cage as much as a shelter. In the aftermath of some ambiguous apocalypse (the appearance of Bruegel's Black Death-inspired painting 'The Triumph of Death' hints at a plague of sorts, or it could simply be a nod to Roger Vadim's Pretty Maids All in a Row - see also a sexually tense conversation between a teenage boy and an older woman) that appears to have wiped out most of the American populace, a family ekes out an existence in their large cabin home, secluded in an area of woodland. The movie opens with the makeshift funeral of the grandfather, a victim of whatever deadly virus now infects the air, his body doused in petrol and set alight by the resultant new patriarch, Paul (Joel Edgerton, an actor whose naturalism results in his not receiving nearly enough credit for his always solid work), husband of Sarah (Carmen Ejogo) and father to 17-year-old Travis (Kelvin Harrison Jr). The following night, the three are awoken by an intruder, Will (Christopher Abbott), who claims he mistakenly believed the house was empty, and he was simply looking for food and water for his wife Kim (Riley Keough) and their young son. Paul is initially mistrustful, and unsure how to deal with the unwanted guest, but Sarah convinces him that it's better to invite Will's family to stay with them where they can keep a close eye on them, fearing they may return with others and take over the home. Paul agrees, and Will and his kin move in to the isolated relative paradise. All goes well at first, with the two families bonding and glad of each other's company, but thanks to an unknown presence in the woods and a series of odd occurrences, paranoia begins to set in. Shults uses aspect ratio in a curious way here. While the bulk of the film is framed in standard widescreen (2.35:1), a series of dream sequences - playing out in the mind of Travis, psychologically dogged by a combination of mourning for his grandfather and sexual frustration, the latter condition exacerbated by the presence of Kim - see the screen subtly compress to a wider, unconventional aspect. Shults explicitly wants us to know we're watching dream sequences - it's his riff on vaseline on the lens - and it lulls us into a false sense of security; when the screen morphs into an even wider 3:1 format for the dramatic climax, the rug is pulled out from under us, causing us to question everything we've accepted as real and unreal up to that point. With It Comes at Night and his outstanding debut Krisha, Shults has given us two curious subversions of the home invasion genre. In his films, the invaders are reluctantly invited in, and the issue of who are the protagonists and who are the antagonists is never clear cut. In Krisha we sympathise both with the titular alcoholic and the long suffering family members who invite her back into their home for an ultimately tragic Thanksgiving gathering, but we see enough narcissism on both sides to make both parties arguably the villain of the piece. Similarly with It Comes at Night, we fear for the safety of both families, as we're given enough small clues to suggest neither may be quite all they seem. Early on in both films, Shults' camera drifts away from the human characters and explores the geography of the homes where the ensuing drama will play out. In Krisha, he establishes the imposing height of the building's interior by tilting his camera up and down to follow a bouncing ball, its trajectory beginning on the hard floor of the open plan area where the family will spend most of their time gathered, and ending on the upper floor, where the eponymous trainwreck will find herself exiled. For his followup it's length, rather than height, that's emphasised early on, with a slow tracking shot down the long narrow corridor that leads from the living quarters to the red door that separates this last bastion of civilisation from the anarchy outside. In both films, none of the humans can be pinned down as the antagonist. Rather, it's the home itself that seems to exert the evil influence, a material representation of shelter from chaos. Like Krisha's family, Paul and his tribe are willing to help Will and his, but it's the home, and the threat of loss of shelter, that threatens this benevolence. It Comes at Night has infuriated many cinemagoers in the US, upset that they weren't given the horror movie the film's marketing hinted at. But Shults' film is very much a horror movie. It may not explicitly feature a haunted house (though the unanswered question of who opened a door at a key plot juncture hints that it could well do), but it does feature a house that's haunting its human dwellers, causing them to reject their humanity in order to protect their narrow material idea of civilisation. In It Comes at Night, as in Krisha, the home is where the hatred is. 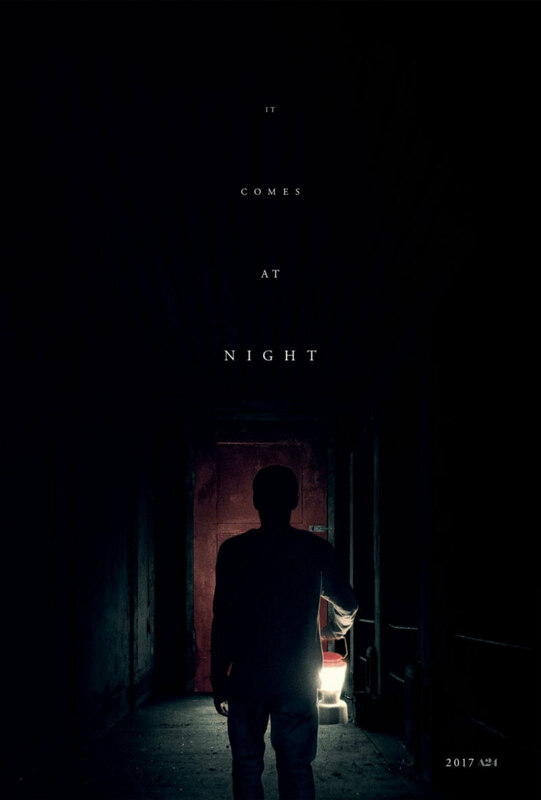 It Comes at Night is in UK/ROI cinemas July 7th.